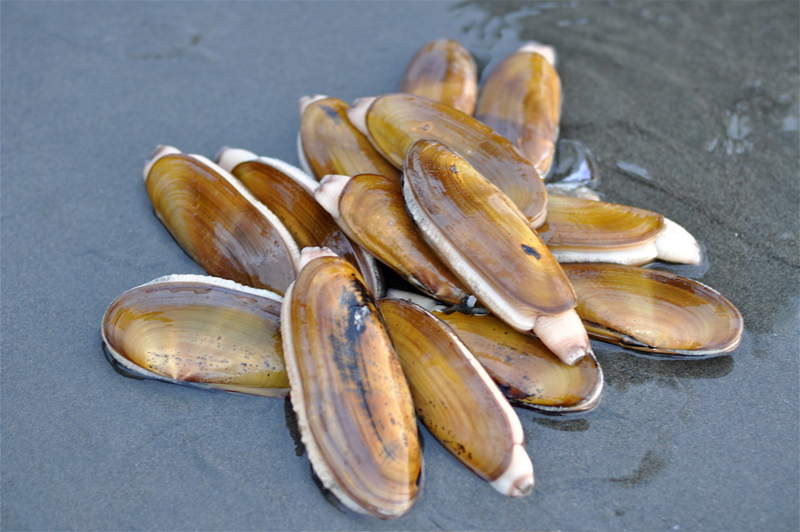 With a tentative fall schedule of razor clam digs released by the Washington Department of Fish and Wildlife, it's time once again to turn our attention to the golden-hued shellfish of Pacific Northwest dreams, the one that inspires thousands of otherwise sensible citizens to flock to the coastal tsunami zone during the most miserable beachgoing months of the year and get in touch with their inner hunter-gatherer. Indeed, on your average razor clam opening, you will see more people on a Northwest beach than on the sunniest summer day of the year. Lots more. Razor clam culture is an especially big deal in the Evergreen State, big enough to warrant a new book solely on the subject from the University of Washington Press. 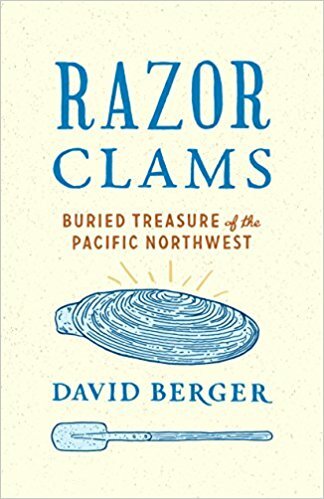 For the uninitiated, David Berger's Razor Clams: Buried Treasure of the Pacific Northwest, is just the ticket to understanding what all the fuss is about. Berger is a lively guide to Siliqua patula's ecology, culinary lore, and historical importance in the region. Smartly, he peppers the book with recipes throughout, for the razor clam is rightly considered a local seafood delicacy up there with salmon, spot shrimp, and Dungeness crab, if a bit more blue collar. (Razor clams rolled in Ritz crackers, anyone?) Berger's recipes span the spectrum, from deep-fried fritters to poached clams with snap peas and champagne vinaigrette, and of course several different chowders. Learning about the natural history of my quarry is one of the reasons I forage. In this case I learned some new things about an old favorite. To wit: Razor clams have copper-based blood, not iron-based, so they can accurately be called blue-bloods. Surprisingly, their preferred diet of microscopic phytoplankton has shifted in the past century, with various species of diatoms revolving at the top of the menu, possibly as a result of dam-building on the Columbia River. I picked up some new slang, too. Seagulling is the act of horning in on a successful clam digger's spot. The author also gets into the finer points of naturally occurring toxins that have put the kibosh on entire seasons in past years, from domoic acid to the sinister sounding Nuclear Inclusion Unknown disease, or NIX. For many clammers, the excitement is all about the capture—that moment when primitive hunter-gatherer impulses start flowing like teenage hormones. Berger supplies the necessary info to get started, with a detailed analysis of the two main digging tools, the shovel and the tube (and a discussion of which is worthy of the label "clam gun"), and strategies for locating the hidden jewels. But my personal favorite parts of the book concern the culture. The author introduces us to several characters whose working lives are deeply connected to a humble clam, such as a state biologist who develops a more accurate method of counting the overall population; the mayor of Long Beach, where an annual razor clam festival celebrates the mollusk's role in coastal economies; and a tribal digger from the Quinault Indian Nation, who tells us that a few good tides might earn him up to a thousand dollars. "That's enough for me for a month," the tribal digger says, reminding us of what constitutes true abundance. Readers looking for such nourishment will find much to savor in this account of a beloved bivalve.